Thoughts, conduct and cultivation of virtues - these three are the basic elements of development of life. If our thoughts are rooted in the ground of holistic approach to solve problems, there cannot be any confusion. If our conduct is permeated with the essence of non-violence and non-acquisitiveness, it will work like panacea for the present age inflicted with the curse of violence and acquisitiveness. It is the prime requisite for the present age that our mental imprints should be imbibed with right faith, right knowledge and right conduct. In the course of our Delhi-sojourn, an idea to propagate this trinity of right thoughts, conduct and virtuous mental imprints amongst people at large was put before us and a series of booklets was planned to be prepared to fulfil this need. Today man is too busy to read voluminous treatises. Though by proper time-management one can find time for the work which is given priority, it is a fashion to consider oneself busy. 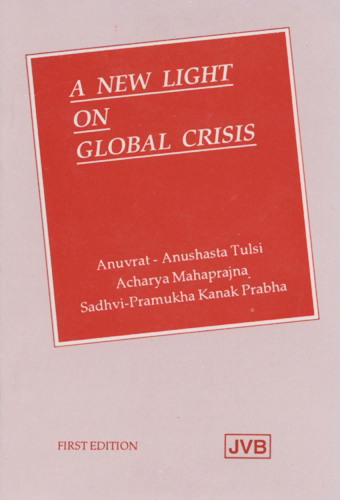 What can be given in a small brochure is included in the tract "A New Light on the Global Crisis". To understand the Jain way of discipline, it is necessary to comprehend the Terapanth and its present activities such as Anuvrat, Prekśha Dhyan and Jeevan Vigyan, which constitute its dynamic strides in the direction of progress. We hope the readers will themselves feel the ecstasy by diving deep into them.